Côte Saint-Luc volunteer Citizens on Patrol (vCOP) smoke detector brigade will be ringing door bells and offering to check smoke detectors, replacing dead batteries and installing new smoke detectors where needed for the fifth consecutive year. And City Hall will be sending out hundreds of phone messages in advance to alert residents to these visits. Members from our volunteer Citizens on Patrol, or vCOP, will be ringing doorbells on Smart, Wolseley, Hudson and Westminster from April 28 until the end of May. “These vCOP members are part of our smoke detector brigade service. They will be offering to test the smoke detectors in your home. They’ll also replace batteries where needed, for free. Du 28 avril à la fin mai, les membres de notre patrouille bénévole, les vCOP, visiteront les résidences de des rues Smart, Wolseley, Hudson et Westminster. This initiative is done in partnership with the Montreal fire department. If you are not home when they visit, they will leave a notice with information on how to schedule a visit. This is a free service. “Smoke detectors save lives by warning people of possible fires in a home, but they can only do the job if they are working,” said Councillor Glenn J. Nashen, responsible for vCOP and emergency measures. “Too many deaths occur across Canada that could have been prevented if the house was equipped with a working smoke detector,” Nashen said. Since 1977, the City of Cote Saint-Luc has required smoke detectors in all homes and buildings. The owner or tenant is responsible for its upkeep, including changing the battery twice a year and replacing smoke detectors that are more than 10 years old. A carbon monoxide detector is also recommended near garages and fuel-burning devices. 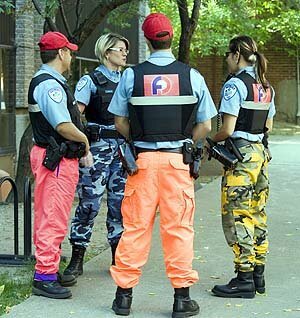 How will we recognize police without clown pants? 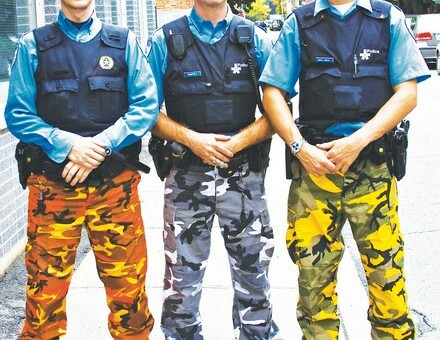 Police who continue to sport camouflage pants on duty could face fines of $500 to $3,000 for each day they wear them under new legislation proposed by the Liberal government, reports the Montreal Gazette. After three useless, sad years of vandalism of police cars (and fire trucks and ambulances with union stickers) and wearing camouflage and clown pants, the government has finally awoken to put an end to this lawless fashion flap. I said early on that it was not fair to claw back on pensions that were already agreed to and that any changes ought to affect new officers or else be renegotiated within their collective agreements. Forget that there are so many police officers earning in excess of $100,000 per year and the time-and-a-half pay for standing at intersections pushing traffic buttons, three times the going rate for trained civilians. These folks put their lives on the line, after-all, to protect us and deserve to be reasonably well paid for doing so. And they normally deserve our respect and appreciation. But, their protest have gone much too far. Three years were three years too long. They also should have no right to deface their patrol cars. Same for the firefighters and Urgences Santé ambulance technicians. This is public property and no one has the right to cause such damage without penalty. If you did it you’d be held accountable. Why not them? These public safety professionals have caused immeasurable harm to their own brand. They have lost respect from the public they serve. People laughed at first the they ignored the outlandish uniforms altogether. How sad. What kind of a message was that for our children? Shameful, I say. And the proposed legislation doesn’t go far enough. What about the cars and trucks and ambulances? What about our firefighters and ambulance techs? 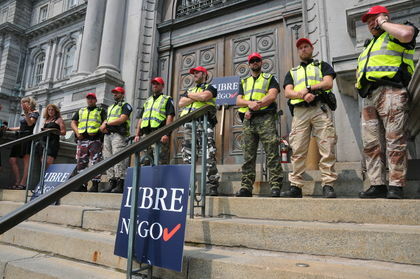 And what about our local public security forces? Hopefully these folks will finally understand it’s time to pull up their pants – their uniform pants – and start off their next shift while putting their best foot forward. It’s time to earn back the respect they lost. CSL will be flushing the fire hydrants in your area in the next few weeks in areas south of the Baily tracks. We do this twice a year to make that sure our fire hydrants work properly and also to help clear sediments from the underground pipes. After we’re done, you may notice that your water is slightly coloured. This is normal. It’s not dangerous. All you have to do is run the water until it’s clear again. Nous allons procéder à une inspection des bornes d’incendie dans votre coin, au sud de la rue Baily. Nous faisons ceci deux fois par année afin de nous assurer que les bornes fonctionnent correctement et aussi afin de déloger tout sédiment des conduites souterraines. Lorsque nous aurons terminé, il se peut que votre eau soit légèrement colorée. Ce n’est pas dangereux. Il vous suffit de laisser couler l’eau jusqu’à ce qu’elle soit claire. At this week’s Public Council meeting we reviewed notable incidents and events occurring in the previous month. One such incident involved the Montreal Fire Department, with the support of CSL Public Safety and the Police who were on scene on Feburary 8 as a fire destroyed a two floor apartment on Kingsley. Thankfully, no one was home at the time that the fire started, apparently in the kitchen. The home daycare in the apartment next door was not damaged, nor were any other units as the fire was in the corner apartment. Special thanks to our emergency responders, professional and volunteers alike, for their care in dealing with our residents and their property in such urgent situations. Richard Liebman, Assistant Director of the Montreal Fire Department for Strategic and Operational Planning, as well as Louise Desrosiers, Division Chief, serving the territory including Cote Saint-Luc and surrounding areas. Rick is no stranger to CSL. He is a longtime volunteer at the Emergency Measures Organization (which became EMS) going back to the 1980s and eventually rose to serve as Director of the CSL EMS first responder service. Rick also became a firefighter in CSL and in 2002 moved to the Montreal Fire Department as part of the forced mega-merger. Impressively, he rose in the ranks to the position of Assistant Director. Rick and Louise described how the FD responds to 128,000 calls each year. 80,000 of these calls are first response medical calls. The FD covers first response across the Island of Montreal with the single exception of Cote Saint-Luc where the highly skilled volunteer EMS is the authorized responder. What’s more, those needing assistance during an evacuation may register online on the Montreal Fire Department website. The firefighters will be advised en route to a building of such residents requiring assistance. Liebman reminded the vCOP members, “When you change the clocks change your batteries in your smoke detectors”. Of course, with the vCOP Smoke Detector Brigade as a major community initiative the volunteer needed little reminding in this area. Liebman congratulated our city for our sprinkler bylaw. “CSL an early leader in fire sprinklers,” the Assistant Director said. As the councillor responsible for the adoption of this bylaw, along with Councillor Ruth Kovac and supported by the late Chief of Prevention of the CSL FD, Doug Lions, in the early 90s I took great pride in this compliment. I would be remiss in not saluting the Montreal Fire Department, Service Incendie de Montreal, for recently translating much of its website into English to benefit a great number of residents of the Agglomeration of Montreal. With the formal presentations done the supervisors distributed 10 years pins to several members. The next Recruiting Evening was announced for October 25 at 7pm at City Hall. Any one interested in joining vCOP is encouraged to attend. With some members getting on in years it was decided to launch an Associate Member classification for vCOP. Those who have given at least a few years of service would be welcomed into the Associate program where they would no longer be required to do at least two patrol shifts each month but could offer their time in other ways as well. In this way they could continue to be active, although less often, in ensuring that vCOP remains a strong visible deterrent to criminal activity in and around CSL. Congratulations to the most recent Patroller of the Month: David Goldsmith. Bernie and Cookie Band were recognized for putting together the statistics for the group for the last 10 years. Volunteers Robert McDuff and Jeff Smith were recognized with a certificate of appreciation for their quick thinking and sharp eye in spotting a young woman in distress in Rabin Park. The vCOP duo kept her as alert as possible while awaiting the arrival of Public Security and EMS. Their intervention was most important in getting this woman to needed medical care and ensuring her personal safety. We wish to recognize your professionalism and exemplary contributions to the vCOP program during the event last September. While on patrol, you and your partner came to the aid of a woman in need of medical assistance. Through your rapid intervention, you have made the City of Côte Saint-Luc proud and have highlighted the value that the vCOP program brings to the people of Côte Saint-Luc. Your contributions radiate across the membership and help to portray a positive and professional image of our organization. With a core mission of helping our citizens and ensuring their safety, your actions contributed directly to the mission and for this reason, we want to demonstrate our appreciation. McDuff and Smith represent the best that vCOP offers in delivering sharp observation and summoning the necessary emergency resources when most needed. If you would like to help contribute like those dedicated volunteers mentioned above please join us on October 25.